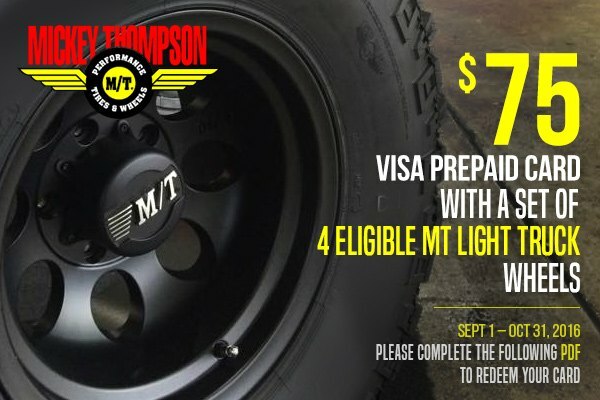 Purchase Mickey Thompson Products and get up to $100 back! - Ford F150 Forums - Ford F-Series Truck Community. Nothing says more about the truck then the tires and wheels it rides on. If you're looking for a set for your Ford F-150, that would have excellent steering response, superior grip, great all-weather traction and rugged off-road style, Mickey Thompson brand is what you need. They are built exclusively for off-road enthusiasts, who seek for maximum performance and rugged look for their truck. If you're one of them, don't miss your chance and take part in Mickey Thompson Promotion at CARiD! 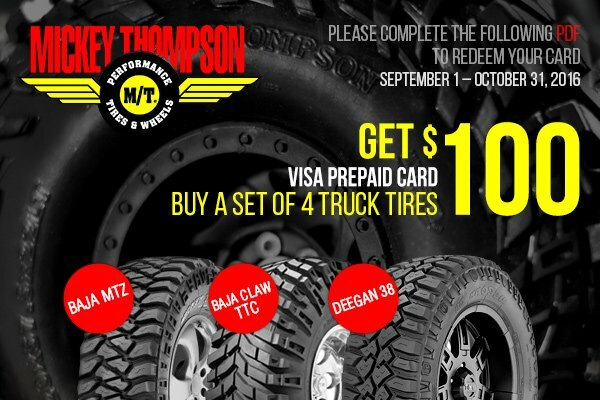 Purchase a set of four (4) Baja MTZ P3, Baja Claw TTC or Deegan 38 Mickey Thompson Tires and RECEIVE a $100 Prepaid Card by mail or GET a $75 Prepaid Card by mail with the purchase of four (4) high quality Mickey Thompson Classic III, Classic III Black, Classic Baja Lock, Sidebiter II, Deegan 38 Pro 2, Deegan 38 Pro 4, MM-164B, MM-164M, MM-245, MM-366, or MM-489 Wheels. Both offers are valid through October 31, 2016. Shoot me PM or leave your inquiries below, and don't forget to include your zip code! Act now: purchase UnderCover Swing Case at CARiD and GET $25 Mail-in Rebate! Quick Reply: Purchase Mickey Thompson Products and get up to $100 back!